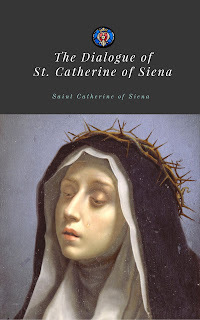 Saint Catherine of Siena, a mystic, dictated the Dialogue while in ecstasy. The work is a dialogue between God the Father and the Saint. It begun in 1377 and finished by 1378. She was a tertiary of the Dominican Order and was declared a Doctor of the Church in 1970 by Pope Paul VI and is one of the six patron saints of Europe.